Rely on us. We're specialists in the transportation and placement of precast concrete. We take a total view of the job, and we have the required experience and capability for every part of it. We'll work with you to plan your project from panel delivery or layout to standing the panels on the day. Specialist equipment? We have it all. Our gear's designed specifically to ensure a smooth, hiccup-free project. From panel jibs, panel skates and panel bars to panel stands and panel trailers, you can be sure of the exact support you require. Equipment's one thing. Our people make the difference. Our team is comprehensively trained in panel erection method statements and lift planning. Simply, what we offer is peace of mind. When it comes to Health & Safety, we're meticulous. We understand the demands of the tightest schedules too. You can be sure we'll do what it takes to ensure your project is on time. Winners last year, we were a finalist in the 2013 New Zealand Health & Safety Awards for our work to create an industry standard lift plan. It's an unremitting focus. 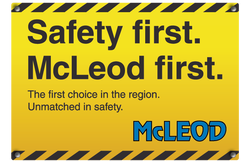 We're leaders in creating a safer industry. It's a benefit to every customer we serve. Extra support? We make it easy. We can provide a very experienced panel team to ensure your whole job runs smoothly. Just call us. We'll create a Panel Placement Package that fully meets your requirements and removes every professional or capability concern. Yes, whenever you need them. McLeod can supply props for your next precast project. Call us for details.